Silent Art Auction to Benefit the Draft Horses at Fosterfields Living Historical Farm - September 12, 2015 ~ The History Girl! The Friends of Fosterfields and Cooper Mill extend an invitation to join them at a Silent Art Auction on Saturday, September 12 from 12:00 noon to 4:00 pm at the Frelinghuysen Mansion, located at the Frelinghuysen Arboretum, a facility of the Morris County Park Commission, 353 East Hanover Avenue, Morristown, NJ. 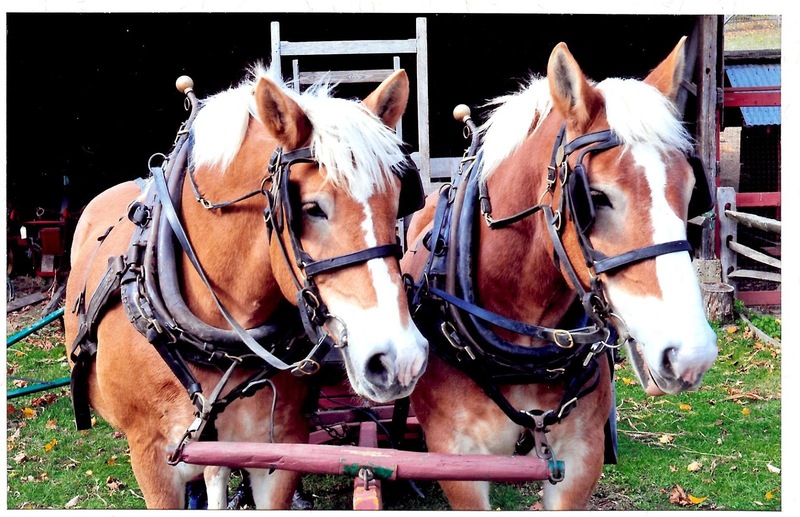 The Silent Art Auction hopes to raise funds for the retirement of Calvin and Hobbes, the beloved draft horses currently at Fosterfields Living Historical Farm, also a facility of the Morris County Park Commission, and the future purchase of a new draft horse team for the farm. Calvin and Hobbes. Photo by Ralph Iacobelli. The donation to attend the Silent Art Auction is $20 for an advance ticket, or $25 at- the-door on the day of the event. To purchase tickets for the Silent Art Auction, or for more information, please contact 973-512-3458 or ylla53art@gmail.com. The purpose and objective of the Friends of Fosterfields and Cooper Mill is to assist the Morris County Park Commission in maintaining an outstanding living historical farm and related historic enterprises, and to promote and sponsor an education program of historical and agricultural projects and activities. The Friends of Fosterfields and Cooper Mill is a 501 (c) 3 non-profit organization.